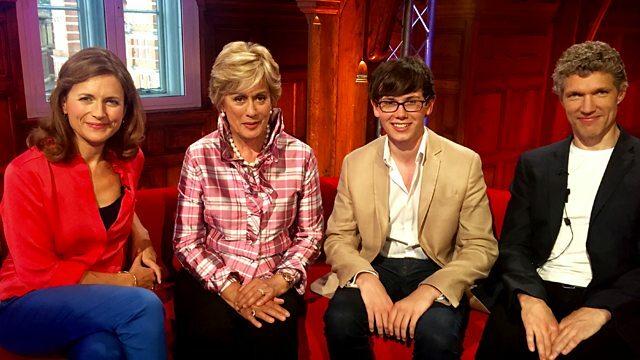 Dame Kiri Te Kanawa, pianist Martin James Bartlett and cellist Matthew Barley join Katie Derham for this edition of the weekly Proms magazine show. The weekly Proms magazine show. Dame Kiri Te Kanawa, Martin James Bartlett and cellist Matthew Barley join Katie Derham for this edition, spreading the news about the Late Night Sinatra Prom, HK Gruber's world premiere and Elgar's Second Symphony. Music in the studio is provided by former Young Musician of the Year, pianist Martin James Bartlett. Conductor: Nicholas Collon. Performer: Aurora Orchestra. Conductor: John WILSON. Performer: Seth MacFarlane. Performer: John Wilson Orchestra. Conductor: Sir Mark Elder. Performer: Hallé Choir. Conductor: John Storgårds. Performer: Colin Currie. Performer: BBC Philharmonic.